Home Reviews Is The Brother CS6000I Your Next All-Purpose Sewing Machine? If you've been looking at sewing machines online, you've no doubt encountered the Brother CS6000i. 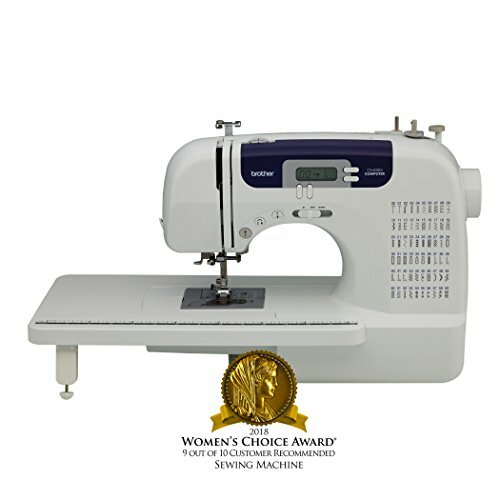 It seems to be on almost every "best of" list, from The Tool Report's Best Sewing Machines of 2018 to Good Housekeeping's list of "Best Sewing Machines for All Levels." But does it live up to the hype? If you look at the specs, there's a lot to be excited about with this sewing machine. First, the Brother CS6000i is extremely reasonably priced. In a marketplace where you can pay as much for a sewing machine as you can for a small car, this means a lot. Also, it has a lot of functions. Decorative stitches? Check. An elongated arm for quilting and sewing sleeves, oh yes. Serging capabilities? You bet. It even has a one-step buttonholer, and if you're a garment-maker like me, that's big. The machine does have its limitations, though, and it isn't for everyone. So before you lay down your money -- even the relatively small amount you will pay for this machine -- it's essential to know your needs and understand what you're getting. The Brother CS6000i is a mid-level all-purpose electronic sewing machine. It has a lot of functionalities for what it is, including decorative stitches, serging stitches, monogram options, and a built-in removable free arm. Additionally, it also comes with an impressive accessories pack, including nine presser feet. It's lightweight, weighing just 11 pounds. And it recently won a 2018 Women's Choice Award for customer satisfaction. I call it an all-purpose machine because it does a little of everything. You can embroider a little, quilt a little, serge a little -- more than enough for the average home sewist, in my opinion. However, this is a semi-professional machine at best. If you're building a business around embroidery, quilting, or serging, you might do better seeking a dedicated machine for one of these functions. You can find the Brother Cs000I for between $150 and $200, depending on the retailer. What makes the Brother CS6000i so special? In short, it's a lot of machine for the money. Here's what you get. When I called this machine "mid-level," I meant midway between a good, solid manual sewing machine and a high-end computerized machine. That means that with the Brother CS6000i, the user can manually adjust stitch length and width, like on a manual machine. However, this machine also comes with 60 pre-programmed stitches, including serging, decorative, embroidery, and monogram stitches. You do not have the option, however, to upload stitches of your own, like you can on higher-end computerized models. Nor can you alter or edit the stitches beyond length and width. While most home sewists can probably get along fine with the stitches provided, some advanced sewists may find this limiting. This machine gives you 850 stitches per minute, which, if you're sewing long rows for garments or quilts, is decent. Also, Top Ten Reviews was impressed by how quiet this machine is. Their test rated the sound level at 67.7 decibels, which is about the same as a dishwasher or a normal conversation. Speed control is important. There are times, many times, when you'll want the speed to remain constant no matter how you press the pedal. This machine has it. Also, there's a stop/start button that will let you dispense with the pedal altogether if you wish. Numerous reviewers found the accessories pack to be impressive. Top Ten Reviews particularly liked the high-quality walking foot that was included. They also said that only two other models that they tested came with more presser feet. No sewing machine is perfect, though, and before you buy any sewing machine, it's important to look carefully at its flaws. People seem to be divided on this. When I look at the control panel, I see one that looks like that of my own all-purpose electronic machine. There are a lot of stitching options, but to me, it looks pretty straightforward. The Tool Report agrees, calling it a great sewing machine for learners. Good Housekeeping says something similar. They rate it among their favorite sewing machine for beginners. And Consumer Search calls this machine "simple and intuitive." On the other hand, the four reviewers who tested the Brother Cs000I for Top Ten Reviews found that their learning curve was very steep. They even gave it a D- for ease of use, though they said that the included instructions were very helpful. Eighty-eight percent of over 7,300 Amazon purchasers gave the Brother Cs000I high ratings. The overall rating for the machine is 4.5 out 5-stars. Amazon customers praised this machine's ease of use, reliability, and versatility. However, there were some complaints. Their criticisms seemed to center on thread issues, including thread tension, bobbin issues, and difficulty using the automatic threading function. There were also several mentions of knit fabric causing jams. Consumers do not all agree about ease of use. Some called the Brother Cs000I a perfect machine for beginning and intermediate sewists, while others were frustrated by how long it took to get the hang of its functionalities. If you're looking for a mid-level all-purpose machine for beginners through semi-professionals, you have quite a bit of choice. Here are some competitors to the Brother CS6000i. The Spiegel 60609 is a neat little machine with a lot of fun functions. Spiegel seems to be marketing primarily to millennials with this computerized model. Its main selling point appears to be it's "social sewing" functions. What does that mean? It's Wi-Fi enabled, for one thing. Why would you want that? Well, you can watch tutorials and other content directly on the machine. There is also a "sewing cam," which allows you to film yourself sewing, and upload the video so that other users can watch. You can sync content with an app on your smartphone or tablet. It also has a USB port for easy upload. Aside from these somewhat gimmicky features, you also get 350 pre-programmed stitches with over 1,000 variations. There's a one-step buttonholer, and nine included presser feet. Good Housekeeping and Reviewshub like this model. ​Amazon customers seemed to love it or hate it, however. Those who liked it found it versatile and fun. Those who didn't think that the bells and whistles came at the expense of real functionality. Overall, Amazon customers gave the Spiegel 60609 a rating of 3.2 out of 5-stars. This machine's price is depending on the retailer. It's widely available from many sources, including Amazon and Walmart. 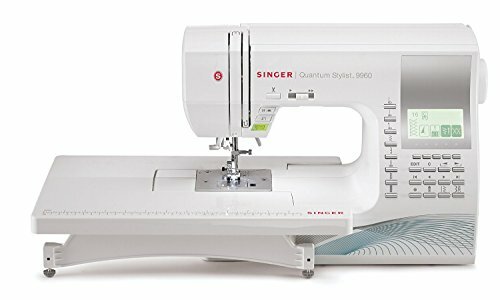 The Singer Quantum Stylist 9960 is a feature-rich electronic sewing machine for an advanced home or semi-professional sewist. The price reflects the difference. While many of machines like the Brother CS6000i can be found for less than $200, the Singer Quantum Stylist 9960 can run you between $300 and $700, depending on the retailer. But what you get is definitely a step up. 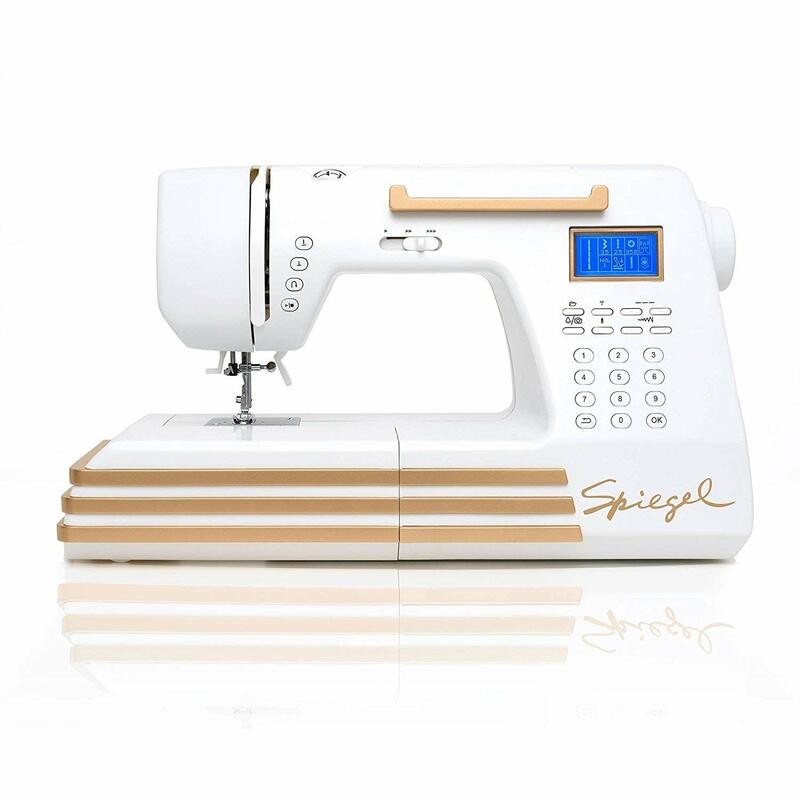 It is a serious machine, whether you're looking for a home sewing machine that you can grow into or something to start your fledgling business. What do you get for your money? Well, as far as stitches go, you get 600 pre-programmed stitches. You also get five alphanumeric fonts and thirteen built-in one-step buttonholes. It also comes with 19 different presser feet. On top of that, like the Brother Cs000I has a removable table extension for free arm work. It is quite a bit heavier than the Brother Cs000I weighing in at 20 pounds. Like the Brother machine, users are not able to upload new stitches into the Quantum Stylist. Embroidery Machine Reviews calls this machine great for beginners and hobbyists, but cautions against the low-quality needles that come with it. A lot of consumer reviewers, however, took issue with the complicated threading system and customer service. Amazon customers gave it a rating of 4.1 out of 5-stars. Programmable patterns allow for a diverse range of designs. The first thing you'll notice about this machine is the price. It costs between $900 and $1,200. However, it's a Janome, and if you've ever talked to a Janome owner, often that's reason enough. A sewing machine is an investment. If you're looking for something that will work for you when you start out, as well as years later, this investment may be a smart one. This is one of The Tool Report's top-rated models overall, and it's easy to see why. This is a good machine for a quilter. It has a limited number of stitches -- just 66 -- but you don't need huge numbers of decorative stitches for quilting. What you do need is a knee lifter, and this model comes with one. A knee lifter allows you to lift and lower the presser foot without using your hands. And if you're free-motion quilting, this is invaluable. Sixty-nine percent of Amazon purchasers rated this machine highly. Overall, they gave it 3.7 out of 5-stars. Quilters especially seemed to like it and didn't mind its relatively small library of pre-programmed stitches. Critical reviews seemed to focus on issues with Janome's customer service. 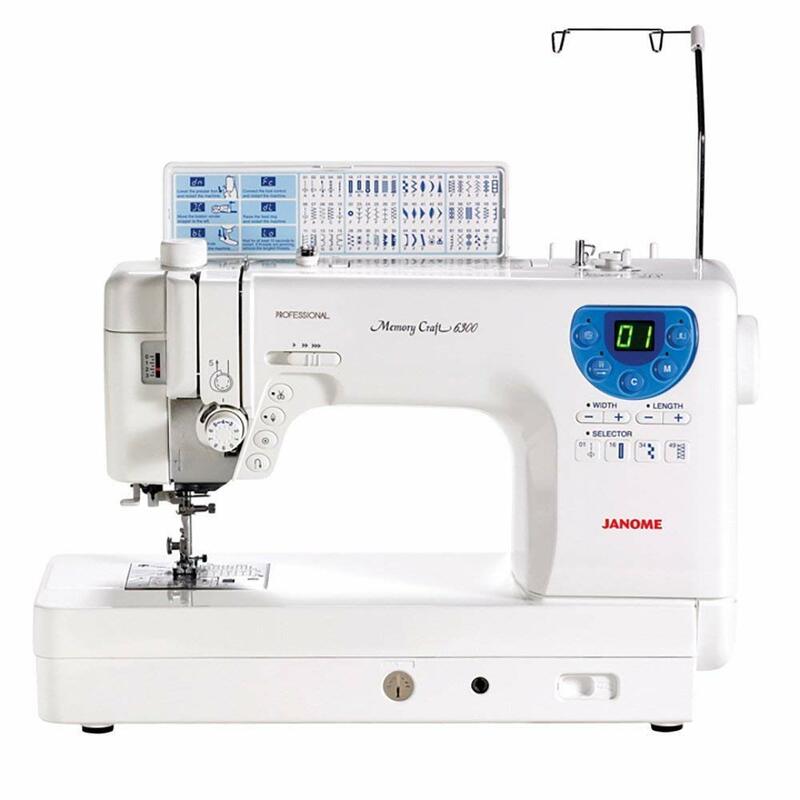 If you're interested in a Janome but are frightened of the sticker price, you might also consider the Janome 2212, which, like the Brother CS000I, is a high quality, lower-priced all-arounder. The Brother CS6000i is an excellent all-purpose electronic machine. It has an impressive variety of pre-programmed stitches that will work well for home sewists from beginners to the semi-professional level. Going by consumer reviews, the Brother CS6000i may be best suited to intermediate sewists. Beginners may be intimidated by the complexity and the steep learning curve. On the other hand, semi-professional and professional sewists may find it limiting. But if you're looking for a solid all-around sewing machine for a variety of home sewing needs, then the Brother CS6000i may be well worth your consideration.